A three-week old American lobster, seen through a camera mounted on a dissecting microscope. The Gulf of Maine brims with hundreds of varieties of transparent crustaceans known as copepods. “If you’ve ever swum in the ocean, you’ve probably swallowed mouthfuls of them,” says Nick Record, a computational ocean ecologist at the Bigelow Laboratory in Boothbay. 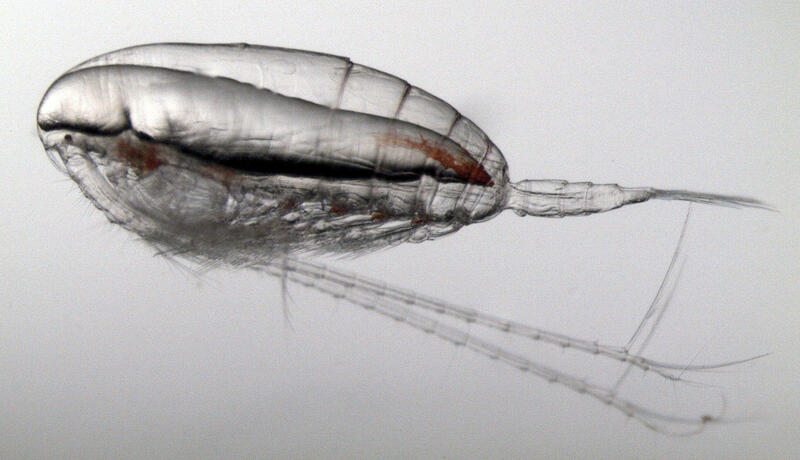 Recently Record has put himself at the computational nexus of a handful of data sets that track a particular copepod in the Gulf of Maine, called Calanus finmarchicus. “They look sort of like aliens. They have one eye, they have these long antennae that they use to detect changes in fluid motions in the water and that’s how they kind of get around or detect predators. I guess you could imagine lobsters without claws and really tiny, like the size of a grain of rice or smaller,” he says. C. finmarchicus billow around the sea by the billions. Rich in fats, they are the nutritional staff of life for endangered right whales, herring and, as New England scientists now have reason to believe, the iconic North American lobster. The clues to this connection can be found in the ocean waters off New Hampshire. Joshua Carloni, a research scientist in New Hampshire’s Fish and Game Division, explains that as part of its permit to go online back in the 1980s, the owners of the Seabrook nuclear power plant agreed to an extensive survey of the seas around its coastal location. “Sampling for different finfish species, sampling for lobsters with traps, as well as lobster larvae, and other types of zooplankton,” Carloni says. The result is a decades-long treasure trove of data, which was sort of overlooked until Carloni came along and decided to check up on a question that has been vexing lobster research for years. “Why do we have all these eggers but not a lot of babies?” he says. Baby lobsters, that is. Carloni wanted to explore why, at a time when the waters off Maine are brimming with egg-bearing lobsters and very early-stage larvae, there has been a decline in mid-term stages. That includes small but fully formed lobster referred to as the babies. Carloni had a hunch they might be starving to death. So he used the Seabrook data to compare their abundance over time with the presence of suspected food sources. None showed a correlation with baby lobster decline, except C. finmarchicus. “A pretty strong correlation. It suggested to us that you had all these eggs hatching in the Gulf of Maine — they could be limited by food,” he says. “There are really very few ‘Aha’ moments in science,” says Rick Wahle, a marine scientist at the University of Maine’s Darling Marine Center in Walpole who has been tracking baby lobsters that settle to the seafloor off New England for 30 years. 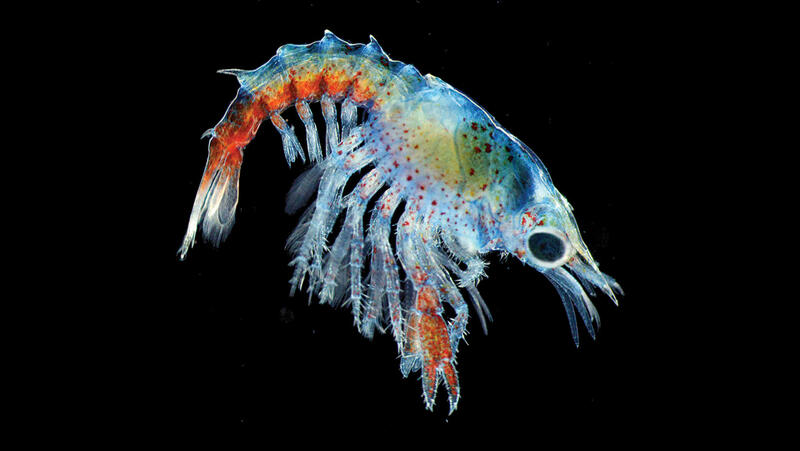 Wahle has shown that the babies’ decline may predict coming declines in the adult lobster harvest. But getting data to explain what’s going on has been like looking into a black box. Carloni’s work on the C. finmarchicus connection, Wahle says, was something of a revelation. “To have one of these moments when you see these correlations and it opens a whole new box of different questions — it’s rather exciting,” he says. Wahle says it’s not a sure bet baby lobsters are dying off due to a lack of C. finmarchicus to munch on. They might be settling in new places, or lobsters and C. finmarchicus might be under pressure from bigger predators. “Such as, jellyfish are a likely suspect. They’ve been increasing,” he says. There’s a lot of uncertainty — particularly in an ecosystem such as the Gulf that is changing fast in response to climate change. Wahle is one of many scientists in New England taking a closer look at copepods as a dynamic element. Among them is Record, who is studying the travel patterns of the endangered right whale, and whether they can be anticipated by the abundance of the whales’ staple food, C. finmarchicus. “We’re finding some surprises,” he says. Record and collaborators are using a supercomputer at the Bigelow Labs to crunch the numbers from multiple data sets. “A few scientists had predicted that at the temperatures the Gulf of Maine are at now there would no longer be any Calanus. And with the warming we’ve had, some analyses that came out a few years ago would’ve predicted that they would have left. But we haven’t seen them leave,” he says. Instead, their seasonal abundance in the Gulf appears to be changing, with a springtime surge of C. finmarchicus near the U.S. coast and a decline farther east in the fall. Scientists are now trying to pinpoint what’s causing those trends, and what they could mean for whales, lobsters and other species that depend on a healthy Gulf of Maine.